FOILED is a genre-bending experience - a mash of coming-of-age, romance and fantasy. It plays in two parts. The first being a story about high school freshmen, Aliera, who is a catch, but no one knows it. She reads fantasy novels, plays D&D, and has an appropriate amount of contempt for the preps, jocks and goths. Most importantly she is an outstanding fencer - though no one cares because that's not a real sport to other high schoolers. All the things add up to a girl who spends a lot of time alone. When the baby-faced new boy comes to school, Aliera finds herself feeling things she's never really felt - or cared to feel - before. Then the two are paired together in science class. Typical innocent adolescent goings-on ensue: cute banter, slaps on the arm, quick looks, lots of dumb jokes, ending with a first date for her (but not for him). 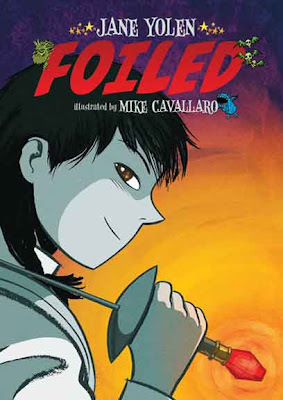 Enter the second installment of FOILED, the fantasy stage. In the middle of Grand Central Station, Aliera fights with the blond-haired boy and fences her way through some trolls, and other creatures. Was it all a hallucination? Was this just her way of making sense of a bad date? Is she really the magical “Defender” of a mysterious underworld? Did any of this actually happen? I've come across several of these mishmash stories in recent years (I KILL GIANTS and PAN'S LABYRINTH to name two), yarns that mix genres and give the reader a realistic fiction story with a heavy dose of fantasy (or possibly pseudo-fantasy if you fall on the side that it's all just in the hero's head) realm. It's an interesting approach. For Aliera, all of this story is built upon fencing. In fact the chapters are structured around fencing terms. This weaponized art is not only a literal activity of the protagonist, but it is a none-too-subtle metaphor for the girl and her emotions. Aliera is taught, in fencing and also in life, to defend her heart. The metaphor is a little heavy-handed, but it is a middle grade book after all. Metaphors are continued in Aliera's form of color blindness (monochromancy) where she cannot see colors at all. Interestingly, Mike Cavallaro used a monochromatic scheme in most of the book. When Aliera discovers the boy's true colors during their date, she also discovers her own ability to discern the color spectrum and the book takes a full color turn as well. With mask on (another metaphor by the way) she pulls out her foil and gets down to business of dispensing of creatures, blond-haired and otherwise. I connected with the first section of the book more than the last, which is funny considering how much of a fantasy junkie I am. The fantasy section felt rushed, making it feel a bit out of place. The truth is I did not really want that element in this book, as I already have a preconceived notion of where Yolen was taking the story. So did FOILED work? Partially. I think the dichotomy between the two halves of the book was a bit discombobulating. However, I do think girls especially will connect with Aliera and her story and I would guess they would prefer the book to stick to Aliera in the real world. Alcohol and marijuana are briefly mentioned when students are in class listening to a boring lecture wishing to be somewhere else or doing something else. It would be an interesting concept to use this graphic novel in the biology or genetics classroom as a way to kick off an inherited traits unit. One could discuss the different types of color blindness (red-green or monochromancy) and the prevalence rate (men versus women). At the same time, the human development or psychology class could use the book to study the emotional development of adolescents (peer relationships, social exclusion, and dating rituals). Down the hall, the literature class could use the title to deconstruct the methaphors and themes rampant in FOILED. How do the metaphors play out? Before reading the passage with Aliera's date, I would have students write down their predictions of what might happen referencing specific passages in the story to support their claims. Through the reading, I would draw the students' attention to the constant use of ravens outside the windows. What do ravens symbolize? Why are they there? Are the purposeful? The art teacher, or art history class, could examine the use of metaphor as an artistic device and explore how Cavallaro used color to tell the story. Would the story be better in black and white? Full color? Why or why not?